Animal body size often varies systematically along latitudinal gradients, where individuals are either larger or smaller with varying season length. 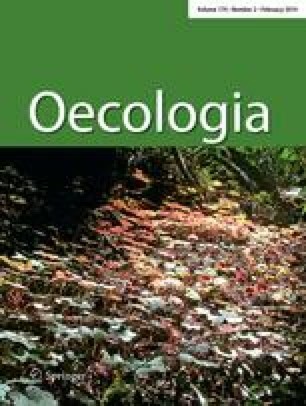 This study examines ecotypic responses by the generalist grasshopper Melanoplus femurrubrum (Orthoptera: Acrididae) in body size and covarying, physiologically based life history traits along a latitudinal gradient with respect to seasonality and energetics. The latitudinal compensation hypothesis predicts that smaller body size occurs in colder sites when populations must compensate for time constraints due to short seasons. Shorter season length requires faster developmental and growth rates to complete life cycles in one season. Using a common garden experimental design under laboratory conditions, we examined how grasshopper body size, consumption, developmental time, growth rate and metabolism varied among populations collected along an extended latitudinal gradient. When reared at the same temperature in the lab, individuals from northern populations were smaller, developed more rapidly, and showed higher growth rates, as expected for adaptations to shorter and generally cooler growing seasons. Temperature-dependent, whole organism metabolic rate scaled positively with body size and was lower at northern sites, but mass-specific standard metabolic rate did not differ among sites. Total food consumption varied positively with body size, but northern populations exhibited a higher mass-specific consumption rate. Overall, compensatory life history responses corresponded with key predictions of the latitudinal compensation hypothesis in response to season length. Communicated by Roland A. Brandl. The online version of this article (doi: 10.1007/s00442-013-2785-6) contains supplementary material, which is available to authorized users. A. N. Laws, W. K. Dodds and J. Reese kindly provided comments on the manuscript. We thank J. Nippert for assistance, T. Grace for discussions about spectral analysis, F. Dowell and E. Maghirang at the USDA-ARS Center for Grain and Animal Health Research for use of the spectrometer for spectral analysis, and C. Shannon for statistical advice. Comments by anonymous reviewers greatly improved the manuscript. This work was funded in-part by the Division of Biology, National Science Foundation (NSF) Long-Term Ecological Research, the Institute for Grassland Studies, and NSF DEB-0456522. This is Kansas Agricultural Experimental Station publication 14-096-J.